Brief Physical Description: Dash is a young boy with deep, blue eyes. His hair is brown, with several strains sticking out due to hair wax. He might appear bigger due to his overalls, but beneath the thick, rubber layer, a lean body hides. On his back is Betsy, or as the producers like to refer to as “Portable Washer 2000”, equipped with multiple tools to aid him in his washing imperium. Brief Personality Description: If you asked the customers and employees at the Slaught-a-lot to describe Dash in one word, that word would unmistakably be; goofy. And it could not be more true. Dash gets excited by the simplest things, and probably is why is considered excellent at his job. That is also a means of annoyance as not everyone considers washing one of the greatest joys in life. He takes great pride in securing that there is neither a smudge or blood stain in the entire Butcher shop. Weird motions and obscure snickering is an ordeal the other employees has learn to live with when Dash pledge himself to his work. Nevertheless, whenever Dash either sees a coworker or a customer, he gives them his biggest and most heartfelt smile. He never goes anywhere without his portable washing device which has been given the name Betsy. Together they are an unstoppable team of pure washing power! (or so his self-made business card states). 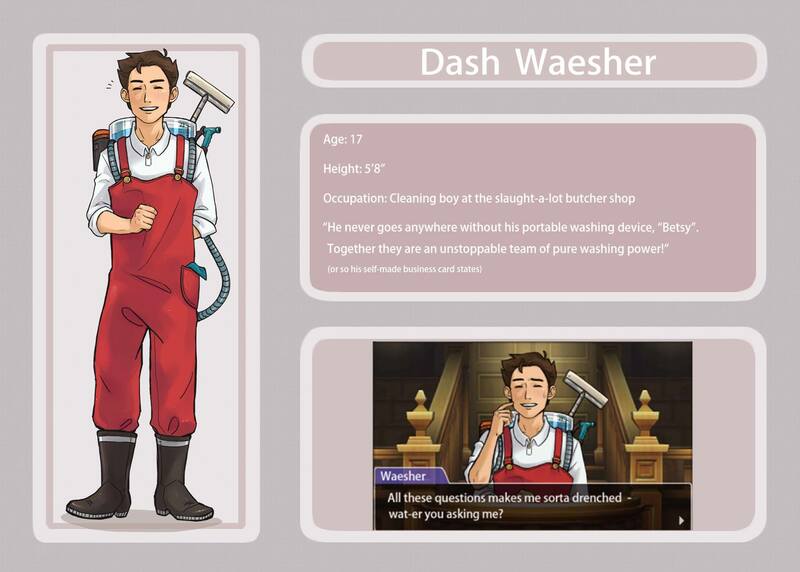 Connection to canon characters (if applicable): According to Dash himself, he is confident that he is Apollo’s very, very distant cousin, hence the similar colors. The credibility of this statement is, however, incredibly dubious. He saw Apollo once in the courtroom and promptly adapted a similar color scheme for his work outfit. Brief Background: Dash experienced a very lonely childhood. His eccentric personality was not commonly accepted by his younger peers, so he accustomed himself to being alone from a very young age. This tore his self-confidence to shreds, and he often found himself at the receiving end of mockery and teasing. However, a reckless attempt at regaining some respect by his classmates, he claimed to be Apollo Justice’s distant cousin. They all doubted him of course, but if you tell yourself a lie enough times, it might become the truth, which it did for Dash. This was the slight flicker of hope that carried him through kindergarten, middle school and to the current day. But his self-confidence was still shattered, until the day he walked by a butcher shop. Dash had always been vexed by uncleanness, and after having a rather irritating day he could simply not overlook the giant spot that resided in the window’s corner. He immediately cleaned it away, proud of his own work, when the chief of the shop noticed his work. He recognized Dash as an excellent cleaning boy, and offered him a job at the shop. Dash was overjoyed, and from that day, piece by piece, he reclaiming his previously lost self-confidence. He found his coworkers to be just as quirky as himself, and he finally found a place where he felt truly accepted. -	His name is an (obvious) pun on “Dishwasher”. -	He actually meets Apollo after appearing as a witness on one of his trials. It turns out that Dash had accidently washed away the victim’s blood, mistaking it for that of an animal. -	At one point a rumor was started that he was having a secret romance with a woman named Betsy. Little did they know that Betsy was the name of his beloved portable washer. -	He often makes incredibly horrible water puns. It brings a cringe out of everyone who hears it, but the smile plastered on Dash as he makes them makes it worthwhile. Surprised: This is a type of cycle animation. It would start with Dash accidently opening his valve to splash water all over his face. He would then get then be wet and have tiny eyes (think of Athena’s nervous eyes). Finally, he would use his mop to clean the water of his face. Cocky: He sprays a tube of toothpaste into his mouth and then cleans it out with his washer, and gives the gallery a sparkling smile. 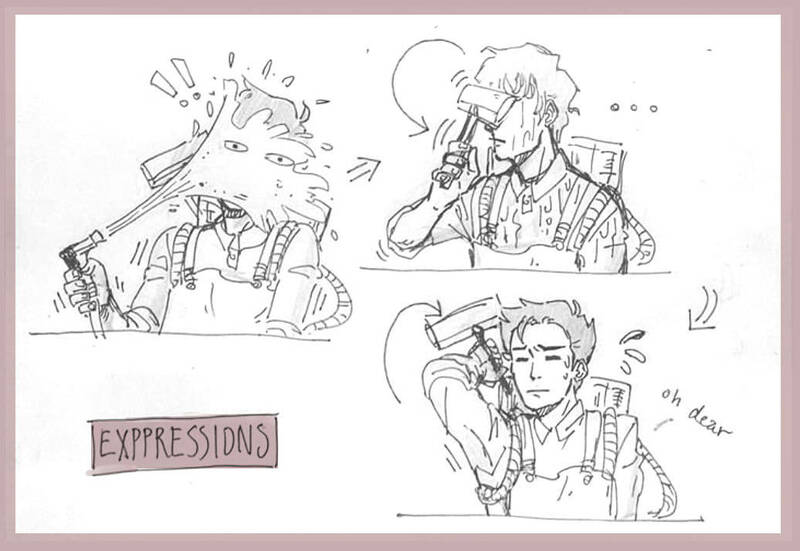 Breakdown: He holds the hose’s tube for too long and it burst completely drenching him in water and knocking him back. Idle: He washes the witness stand until it is completely spotless!...and then some more.